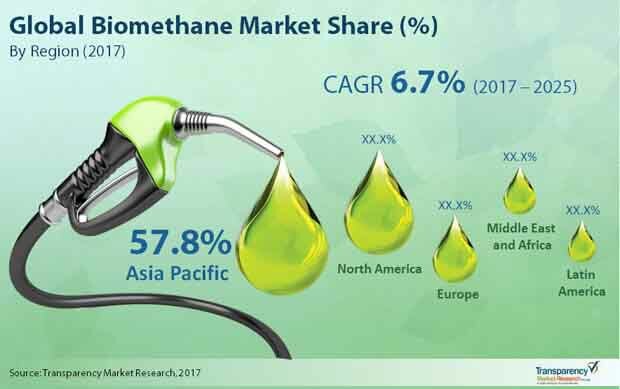 The global biomethane market gas has witnessed massive traction in the recent past and has attracted a number of new companies, making the competitive dynamics highly dynamic and competitive. The market has seen a large number of companies upgrading their production technologies and capacities in order to stay ahead of the competition. Some of the leading companies in the market are Planet Biogas Global GmbH, CNG Services Ltd., VERBIO, SGN, EnviTec Biogas AG, Future Biogas Ltd., Gazasia Ltd., ETW Energietechnik GmbH, Magne Gas, Schmack Carbotech GmbH, Biogas Products Ltd., Gasrec, SoCalGas, ORBITAL, and JV Energen. According to the report, the global biomethane market is expected to expand at a promising 6.7% CAGR from 2017 to 2025, rising from a valuation of US$1,485.4 mn in 2016 to US$2,624.5 mn by 2025. Of the key applications of biomethane, including usage as a vehicle fuel and power generation, the automotive sector presently accounts for the dominant share in the overall market. As pressures to bring down the emission of harmful gases rise on the automotive sector and as petroleum-based fuels continue to see massive cost hikes, the demand for biomethane as a fuel is expected to remain strong in the next few years as well. From a geographical standpoint, the global market is presently dominated by the North America and Europe regions. Collectively, these regional markets account for a lion’s share in the overall market, thanks to rising demand from the automotive sector. Regulations pertaining to environment protection and emission reduction of harmful gases in these regions are key to the increased adoption as well as production of biomethane. The green nature of biomethane is one of the most crucial factors that works in favor of the global biomethane market. The gas is produced by the biological breakdown of organic matter, including agricultural waste, household waste, food industry waste, and industrial waste. The gas is an excellent alternative to natural gas in vehicles and can be filled in a vehicle’s main gas network for the generation of energy. The impressive production efficiency of biomethane production techniques is another key factor that works well for the global biomethane market. Owing to the high production efficiency, biomethane can be used as a reliable alternative for the production of electricity and for the generation of heat. Moreover, the gas can be produced using the same infrastructure setup that is used for the production of natural gas. This factor eliminates the need for additional setup, thus making the cost of production much lesser compared to a number of fossil fuels across several economies.